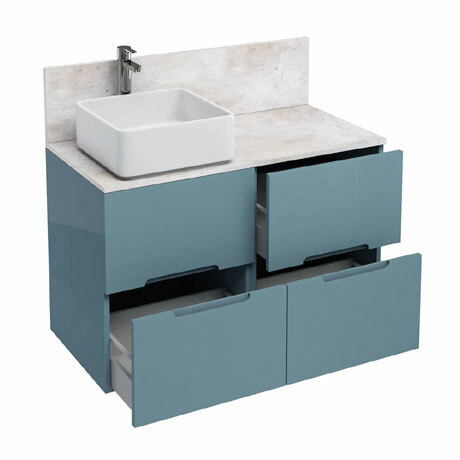 The D1000 Floor Standing Double Drawer Unit with Ceramic Square Basin - designed to be stylish and functional, which is attractive and fit for purpose in the modern day bathroom. Features a marble worktop and splashback with a stunning washbowl fitted on top. The wall-hung or free-standing cabinet options provide deep soft-close drawers for maximum storage. The ceramic square basin has excellent strength and due to a quality manufacturing process, finished with a silica glaze, this basin has a greater depth of colour and prevent porosity. Available in four colours; White, Black, Ocean and Reef with an option of the basin position on the left or right.